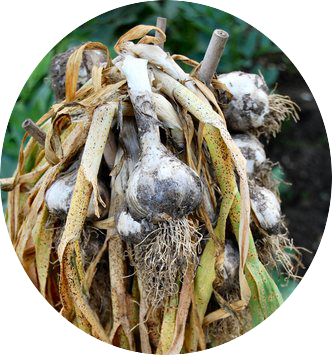 If you are a fan of Mediterranean or Asian cuisine, or have always wanted to start growing vegetables, then growing your own garlic could be ideal for you. It is very easy to grow and takes little or no maintenance, making it perfect for those with no gardening experience, as well as the more seasoned gardener. The two main groups of garlic available are Hardneck (Allium sativum var. ophioscorodon) which has a stronger flavour and fewer cloves which are larger, and Softneck (Allium sativum) which produces smaller and more tightly-packed cloves. Still not sure which garlic variety is best for you? Then take a look at the following list from the Royal Horticultural Society (RHS) which describes each garlic type in detail to help you decide. Chesnok Wight: Good cropper, early summer maturing cultivar, skin and cloves with deep purple veining, strong flavour. Lautrec Wight: Maturing in early summer, suitable for both autumn and early spring planting, does not perform well on heavier soils and cold areas. Considered to be one of the best-flavoured. Red Sicilian: Early summer maturing, spicy flavour, good for roasting. Early Wight: Early maturing, can be harvested at the end of May from autumn planting, best used soon after harvest as it is not good for storage. Solent Wight: Late summer maturing, very good for storage. Germidour: Late maturing, purple-skinned cloves. Purple Heritage Moldovan or Purple Moldovan: Late maturing, heirloom cultivar, producing large purple cloves. Whichever variety you choose, it really couldn’t be easier. Once you’ve purchased your cloves from your local garden centre, all you need to do is follow these simple steps from the RHS for a perfect crop of garlic every time. 1. Choose an open sunny site and well-drained soil. High humidity around the foliage and wet soils make the crop more prone to disease, particularly if planted in the autumn. Garlic does not thrive on acid soils (below pH 6.5). Reduce acidity by applying lime in autumn and winter. 2. Add manure and compost. Prior to planting you can improve the soil’s structure, moisture retention and nutrient levels by incorporating organic matter. Apply about two bucketfuls of well-rotted manure or other organic matter, such as garden compost, every square metre (yard). Avoid using fresh manure. 3. The planting stage. Garlic is planted from bulb segments (cloves), so break up the bulb carefully into individual segments prior to planting. Make sure that the cloves are planted the right way up: the flatter basal plate should be facing downwards. Allow 15cm (6in) between individual cloves and 30cm (1ft) between rows. Plant the cloves so the tips are 2.5cm (1in) below soil surface. 4. Add some fertiliser. On average soils, apply a balanced fertiliser at 25g per sq m (1oz per sq yd). Where organic matter was not applied, double the amount of fertiliser. 5. Let it chill out. Garlic needs a cool, one- to two-month period at temperatures of 0-10C (32-50F) for good bulb development. Planting in late autumn (late October to November) or in early spring (depending on the cultivar) will provide the necessary chilling period.